Donald Price was born on May 20, 1939, in New Jersey. He entered the Aviation Cadet Program of the U.S. Air Force on October 21, 1960, and was commissioned a 2d Lt and awarded his Navigator Wings on September 7, 1961. After completing additional training, Lt Price was assigned to the 28th Air Transport Squadron at Hill AFB, Utah, from August 1962 to November 1964. He next served as an HU-16 Albatross navigator with the 33rd Air Recovery Squadron at Naha AB, Okinawa, and deployed to Vietnam, from December 1964 to June 1967, and then as a C-130 Hercules navigator with the 45th Military Airlift Squadron and a C-141 Starlifter navigator with the 30th Military Airlift Squadron at McGuire AFB, New Jersey, from July 1967 to August 1968. Capt Price served as a C-130 navigator with the 7406th Support Squadron at Rhein Main AB, West Germany, from July 1969 to January 1973, during which time he flew on reconnaissance missions over Europe using C-130 aircraft for radio reconnaissance. His next assignment was as a Maintenance Supervisor and then as Commander of the 322nd Field Maintenance Squadron at Rhein Main AB from February 1973 to July 1974, followed by Air Command & Staff College at Maxwell AFB, Alabama, from August 1974 to June 1975. After completing his bachelor's degree at Auburn University, he served as an aircraft maintenance officer at Norton AFB, California, followed by service with Military Airlift Command at Scott AFB, Illinois. His final assignment was with the 55th Weather Reconnaissance Squadron at McClellan AFB, California, from August 1979 until his retirement from the Air Force on July 1, 1981. 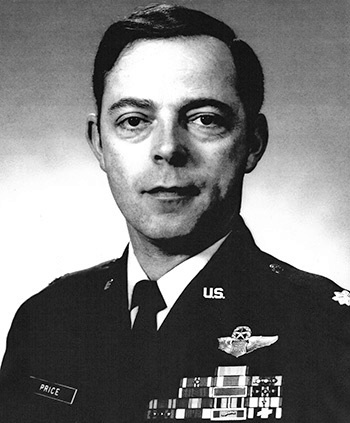 Captain Donald S. Price distinguished himself by extraordinary heroism in connection with military operations against an opposing armed force as Navigator aboard an HU-16B aircraft, in the Gulf of Tonkin, offshore of North Vietnam, on 14 March 1966. 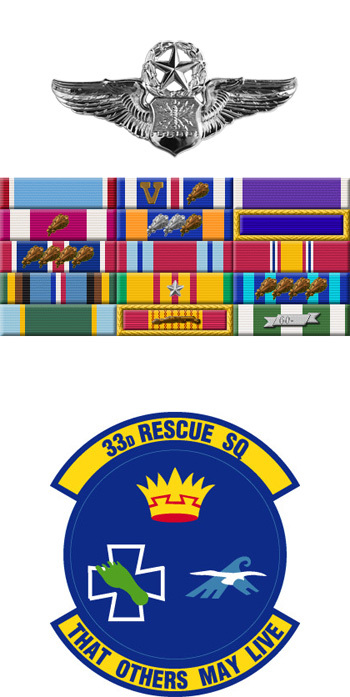 On that date, Captain Price participated in a successful rescue of the downed crew of an F-4C aircraft, in hostile waters. As they approached the area, the downed crew members were sighted. A determination was made that an open sea landing would be necessary to effect a successful rescue. At this time, a force of approximately 25 motorized sampans were observed heading toward the downed pilots. After a full stall landing was made and while they were maneuvering toward the nearest survivor, a heavy barrage of hostile gun fire was directed at the aircraft from the nearby sampans. Moments later, the aircraft was struck, exploded, and was almost immediately engulfed in flames. As the heat from the fire became intense, the crew was forced to abandon the aircraft. As Captain Price jumped into the water, he encountered the F-4C pilot who had discarded both his life raft and life jacket and was struggling to remain afloat. Captain Price towed the pilot on his back away from the burning aircraft and continued to render assistance while awaiting rescue. Several minutes later, helicopters arrived on the scene and Captain Price, although in great pain from multiple wounds received in the explosion, remained in the water to complete his mission of rescuing the downed F-4C pilot. He assisted the pilot into a sling and the helicopter departed. Captain Price was now the sole survivor in the water and artillery shells began to fall around him, preventing rescue by another helicopter. As he struggled into a nearby raft, the sampans began converging on him forcing him to re-enter the water and swim seaward. At this time, two F-4C aircraft and a helicopter arrived in the area. While the F-4C's suppressed the hostile fire, the helicopter effected a successful rescue. By his extraordinary heroism, gallantry, and determination, Captain Price has reflected the highest credit upon himself and the United States Air Force.